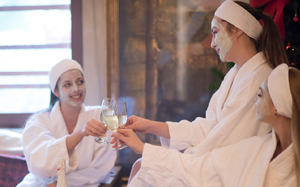 Weddings, hen's parties, conferences, pamper days and more - choose a luxurious spa package from Lagoon Day Spa, the perfect place for relaxation and regeneration in a gorgeous, tranquil resort setting. We also have a separate menu for Public Holidays, please click here to view it. Celebrating with your friends before the special day is an absolute must. This treatment promises you a day or night of relaxation, laughter, pampering and use of the lagoon deck overlooking the water while enjoying your champagne.